I am really excited to be starting this next leg. 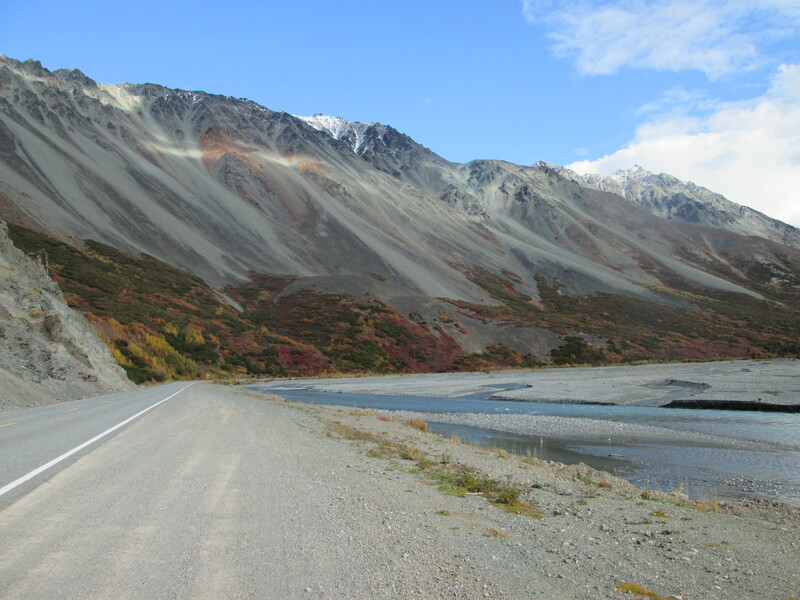 I have heard the Richardson Highway down to Valdez is very beautiful. I couldn’t have picked a better day to leave Fairbanks. Very sunny, crisp Autumn day. 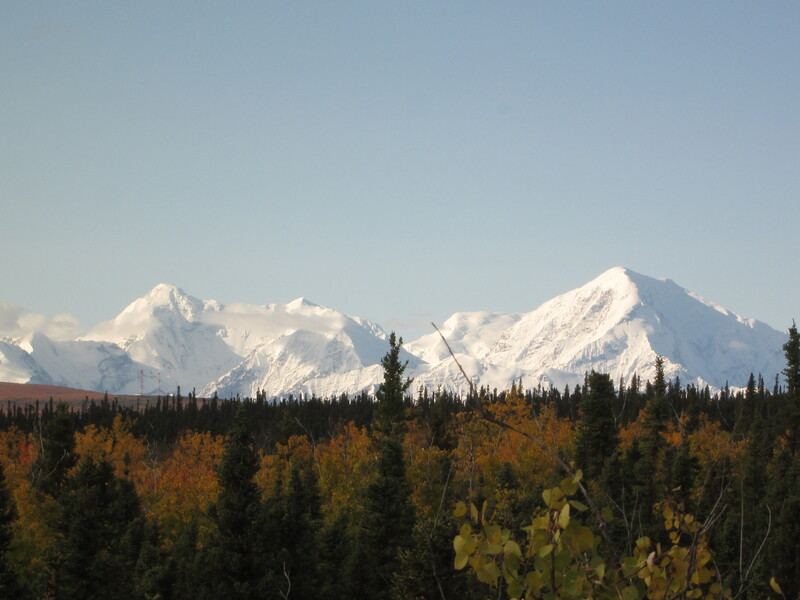 The goal for today is to get to Birch Lake where I have a place to stay with Duncan and Raeann, former “Warm shower “ hosts in Fairbanks. It was a great ride down to the lake. Pretty flat for the first 70 km and then a little uphill at the end. 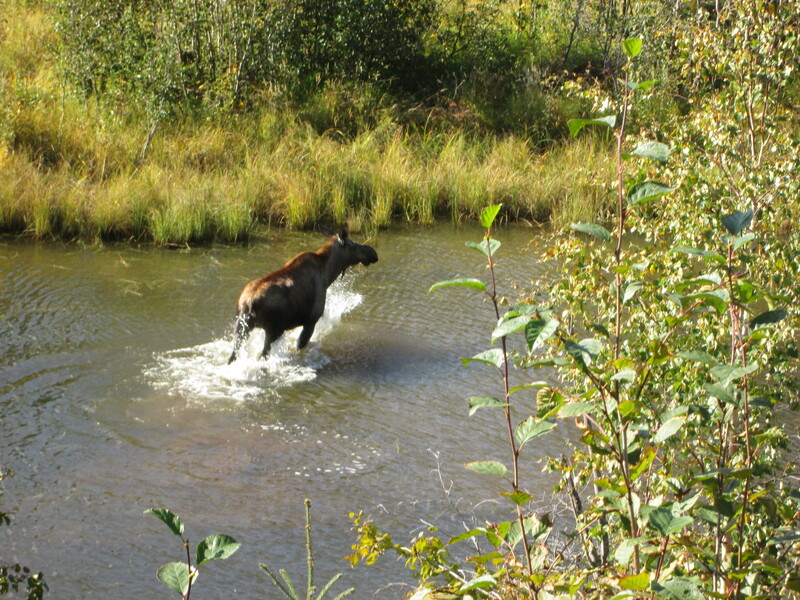 I got a great look at a moose swimming in a river below the road. She left the water when she saw me. She then watched me from the river bank for some time before disappearing into the bush. Duncan and Raeann have a really nice cabin. I have set up camp in the garage. There are about 10 adults and children already sleeping in the cabin. I have gone for the quieter option. Proved to be the cold option. I made the mistake of not putting my fly on the tent and I froze. There are about 6 cabins on the lake. A new pontoon has just been built so people can swim out to it. Man power was needed to load it onto the trailer and then we all went down to the lake to launch it. It was a lovely warm evening. The pontoon just floated off the trailer. It was hooked up to a speed boat and with us on it, towed across the lake to its new home. Once the pontoon was sorted we then went for a bit of a tour around the lake. That evening we sat around the fire pit and socialised late enough so that I got to see my first glimpse of the Northern lights. I cycled through here at the end of July. It has changed so much since then. 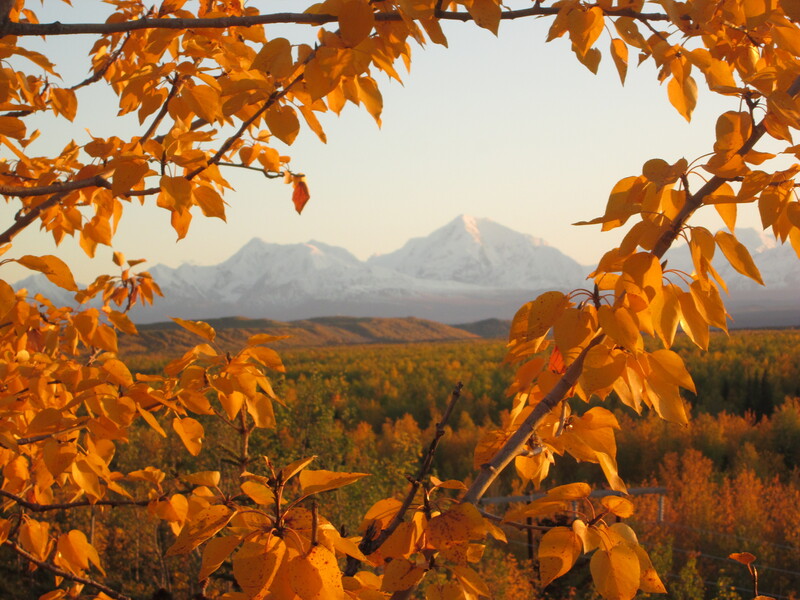 It is much more beautiful – all the trees have turned yellow and orange and the mountains are covered in snow. Tonight I have free camped opposite Fort Greely Army base on top of a bluff with a fantastic view out to the snowy mountains. At 8 p.m. the peace was disturbed when a Bugle was played from the base over loudspeakers to mark the end of the day. It still astounds me that in an evening in the middle of Alaska I can pick up and listen loud and clear to Radio New Zealand with my transistor radio. Over night the sky was completely clear. I saw some good Northern lights and loads of satellites. But it was really cold, so I didn’t wait to see if they were really going to get going. 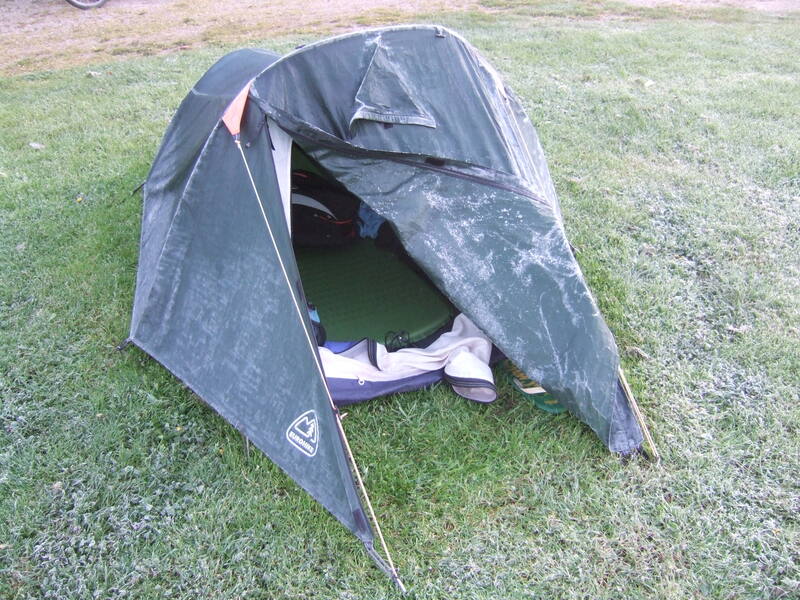 I was keen to start early but the cold kept me in my tent. I am really getting soft. It was a very cloudy morning. The cloud was high enough to leave a beautiful view of the snowy mountains. As the morning went on the view got better the closer I got. Early afternoon I spotted a moose and her calf drinking from a pond. I was able to stop and watch them from the road for over 10 minutes. They watched me for a while but were not too bothered by my presence. 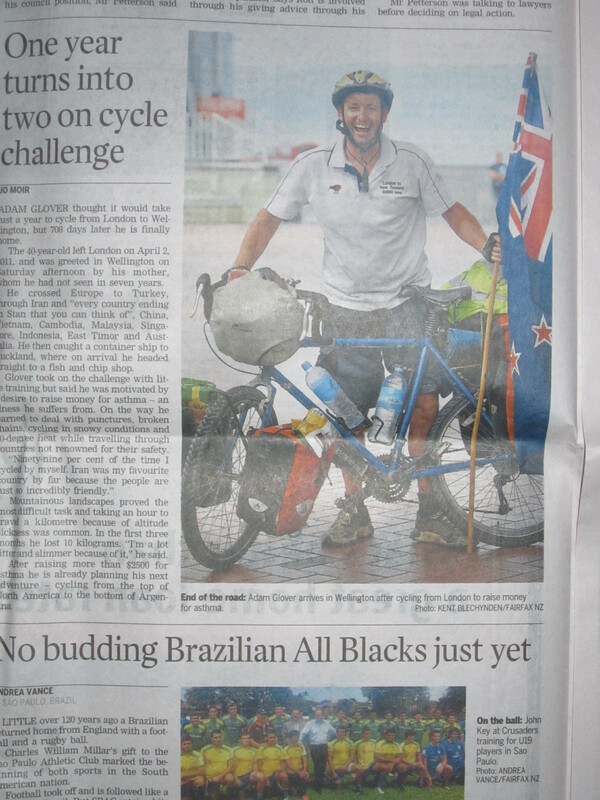 In the end I left them to it…………..kilometres needed to be cycled. Some huge eagles were flying in the valley. 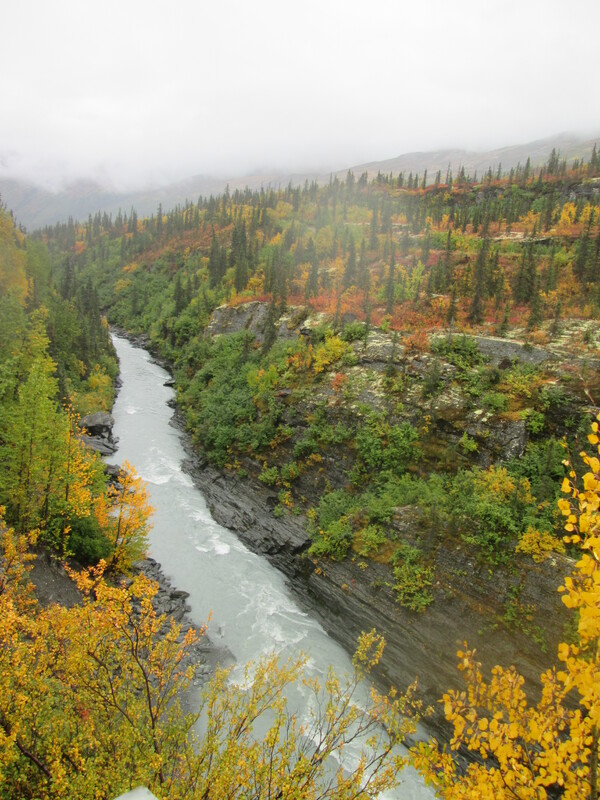 with a spaghetti river criss-crossing its way down the valley. 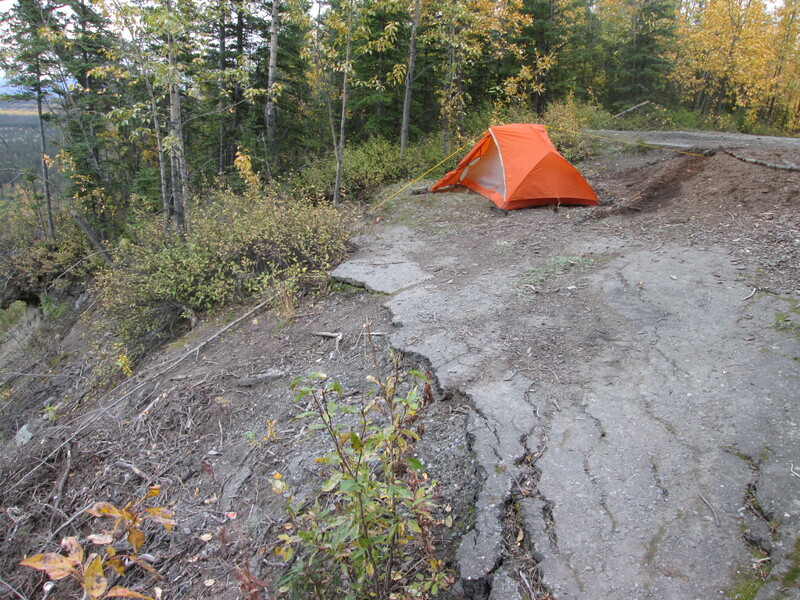 Flanked by steep mountains with the beautiful colours of Autumn on its lower slopes, tonight I have camped just below the summit at Field Lake in the free BML campground. I found a nice spot near the river. It was a good day today. I managed to stay dry despite the forecast and only a little overnight rain. It was only a short climb to the top of Isabel Pass. At the summit was a bit of a 4 km plateau and a large lake. In the distance was a glacier coming down the mountain. 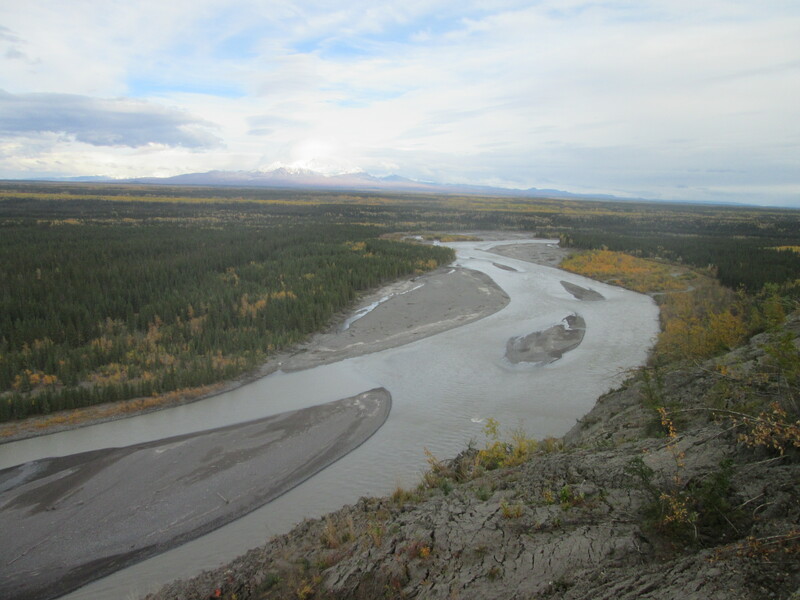 Shortly after starting my descent, the river running from the summit was full of salmon swimming upstream after a journey of at least 500 km. Along the way there was nothing in the way of services. 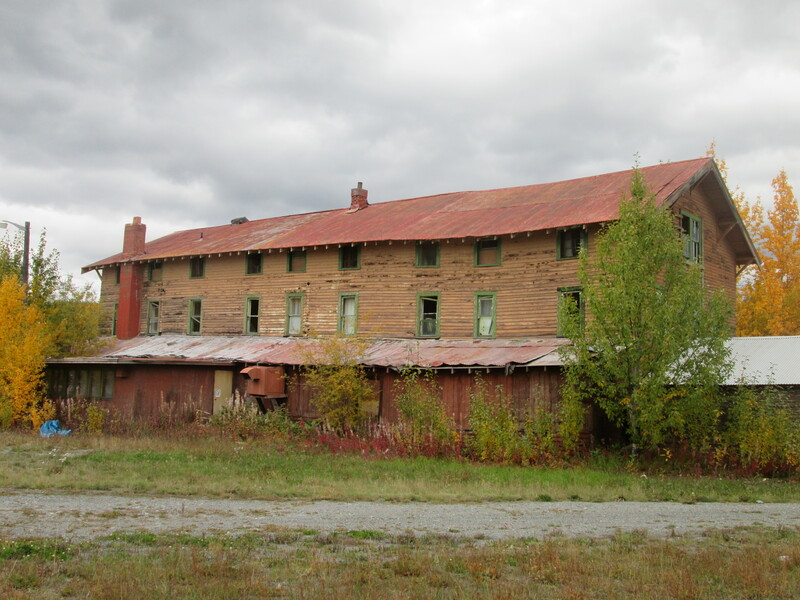 previous prosperous roadhouses. I was so disappointed when I got to Sourdough and found they were closed. I was so looking forward to freshly baked bread that had been mentioned in the tourist guide. I mentioned this to a couple in the campground. 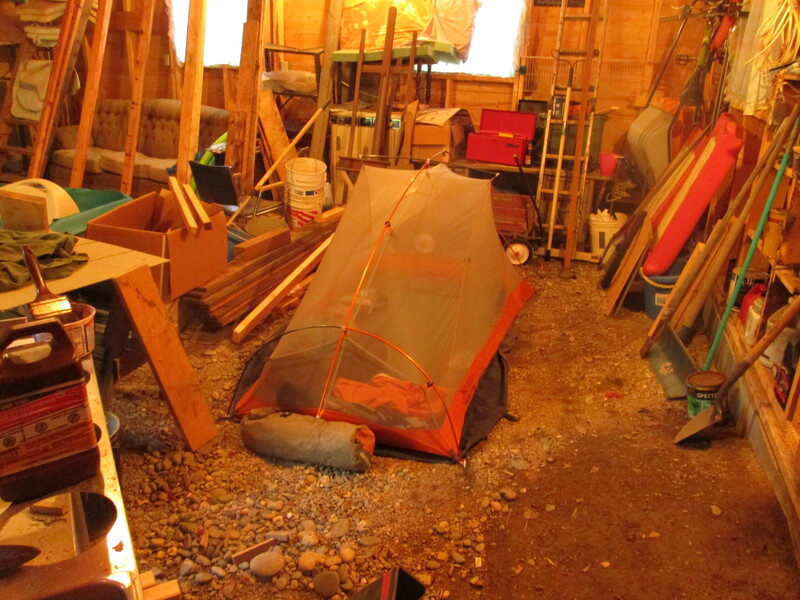 When I got back from a river trail walk, I found a bag in my tent with a loaf of bread and some fruit. People are so kind. I walked down to thank them and this time came away with a block of butter. Again I made some good progress today and I am inching closer and closer to Valdez. It was bitterly cold when I got to Glennallen, a small town about 4 km off the highway. After visiting the supermarket and library, I wasn’t that keen to cycle too much further. I asked about some good places to camp without any real good prospects. About 12 km down the road I came across a small dirt road. I took it and after a short distance it came out on top of a bluff overlooking the Copper river and out over Wangell National Park, over to the huge snowier mountains. The Bluff was a little exposed and it was a little windy. I managed to sit my tent down slightly below the road and tie it down with ropes to stop my tent blowing away. Today was a bit of a sightseeing day and not too much cycling. 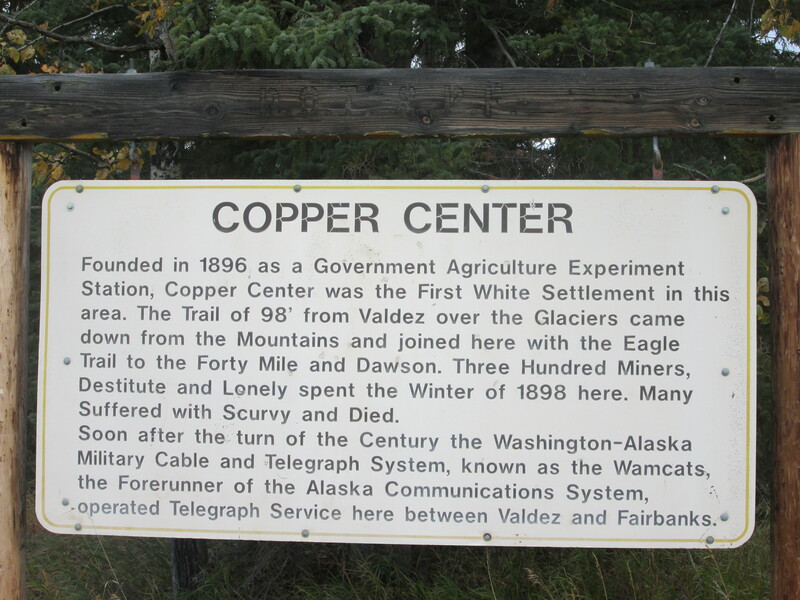 I called in at the Copper centre. Another old mining related town. A number of the old log cabins remain. I called into the lodge and couldn’t help stopping for a breakfast and the use of the free Wifi. 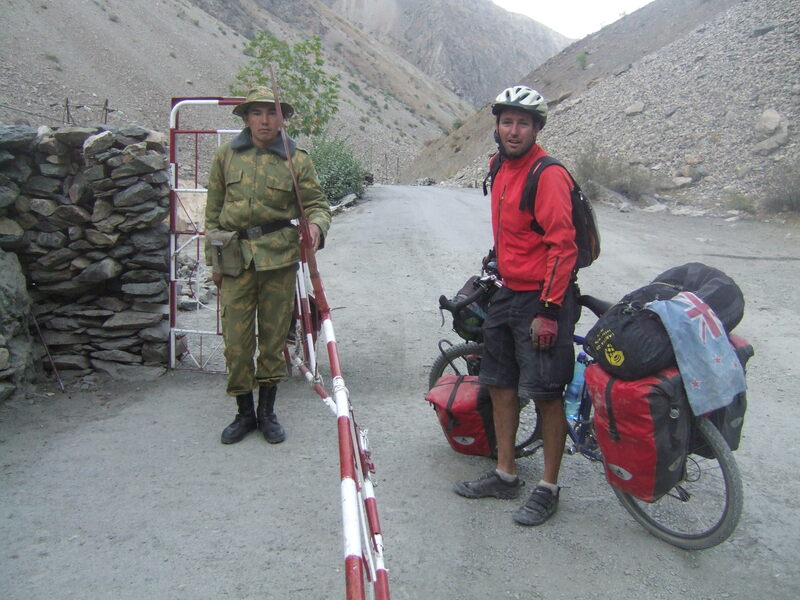 After lunch I cycled on 30 km to the next Lodge. This area of Alaska has a strong Russian presence. Tonsina Lodge is run by a Russian family. I was only calling in for a cup of tea and to get out of the damp and cold when they invited me to camp out the back for the night. I didn’t hesitate in accepting. 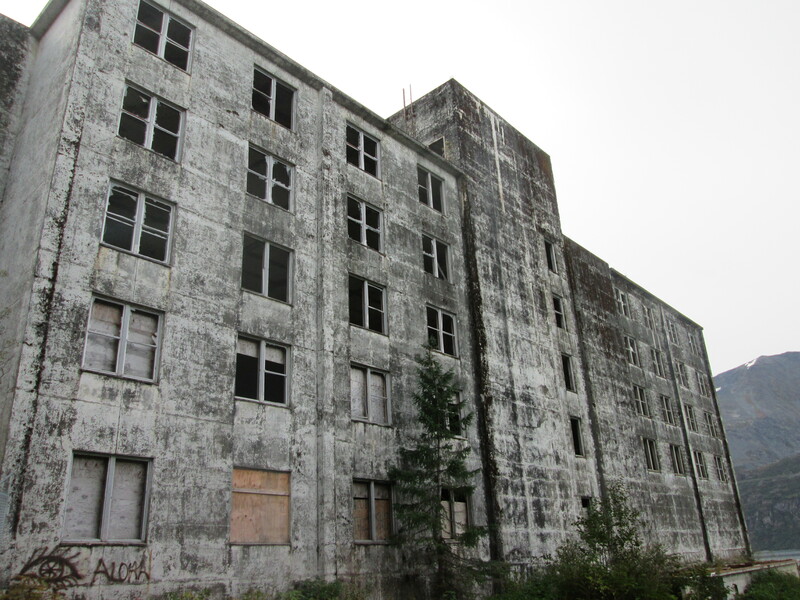 On the grounds of the lodge is an old army barracks that was dismantled and brought up from Valdez a 100 years ago. 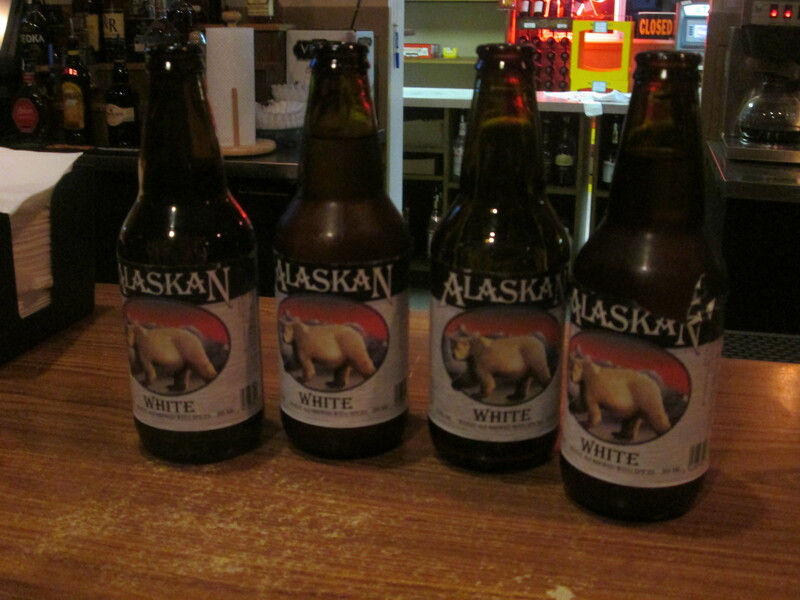 I spent the evening in the restaurant and just as I was leaving was invited by Cory & Pete, two oil workers for a beer. It is always very interesting talking to the locals. I am definitely leaving Alaska at the right time. It is starting to get really cold. When it rains, it just makes it worst. I was dry when I set off this morning. Within 5 km it started to rain and from then on I was drenched, wet and cold. After only 40 km I stopped at a rest area for lunch. There was some firewood around so I started a fire to try and warm up my frozen feet. I was very tempted to call it a day. The thought is…………if I don’t cycle it today I will have to cycle it tomorrow. The weather might not be any better. So I pushed on. It was all uphill as I started climbing Thompsons Pass. I passed a lodge that was closed and is only open 50 days a year during the ski season and is used by heli-skiers who may a fortune. 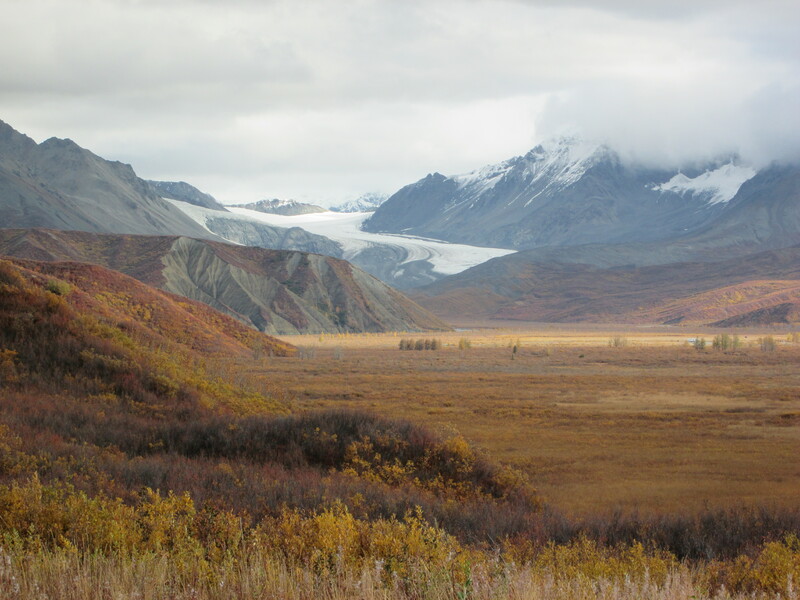 Just before the top of the pass is Worthington Glacier. I called in here to have a look. There was no one around. 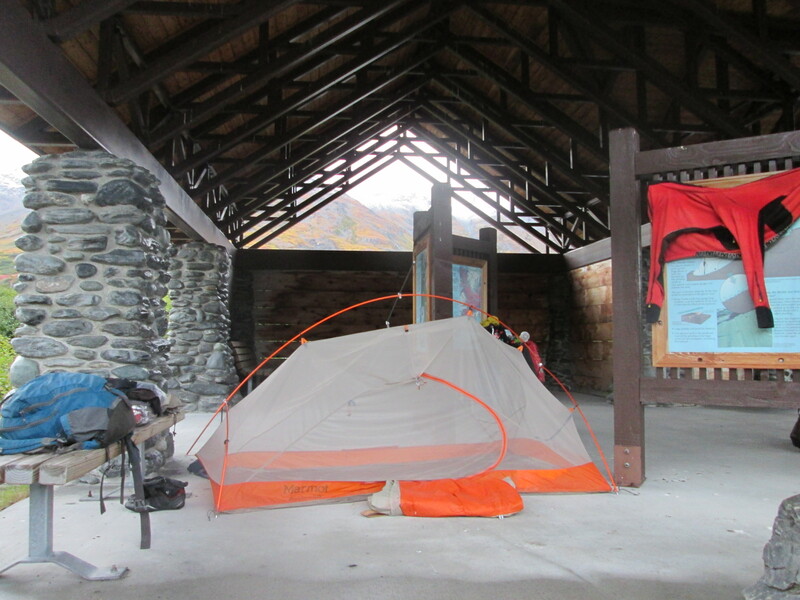 I found a bit of a shelter over by some information boards and pretty quickly decided I was going to camp here. I got my tent up, cooked straight away and was in bed by 5 p.m. It was just too cold to be out. Just as well I was packed up and moving by 9 a.m., because as I left the first of many Tour buses was arriving. I couldn’t see anything going over the top of the pass. It was covered in fog. 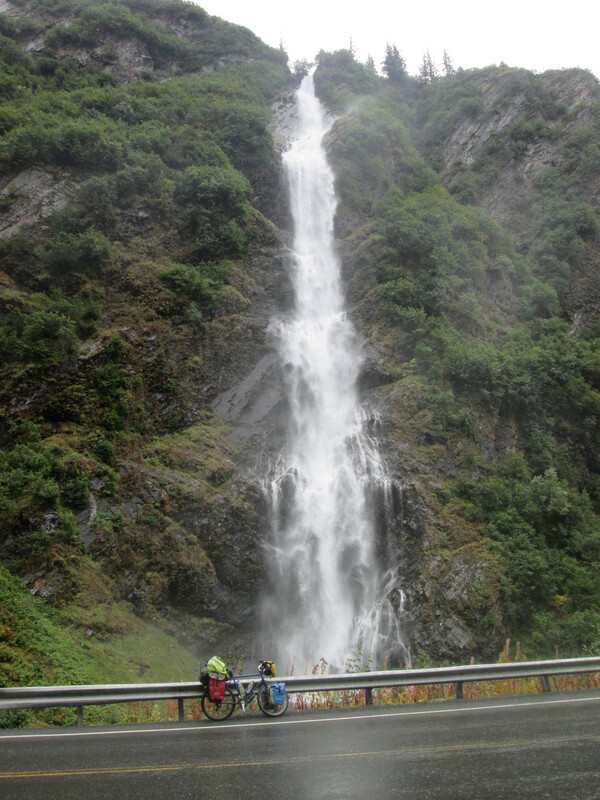 There was a lot to stop and see on the ride into Valdez. Went through Keystone Canyon with huge waterfalls and old railway tunnels. 6 km from the new Valdez is where the old Valdez used to be before the huge 8.2 earthquake in 1964 which resulted in the death of 32 people and the moving of the town. Just 1 km from town was the Salmon viewing area. I have never seen anything like it. 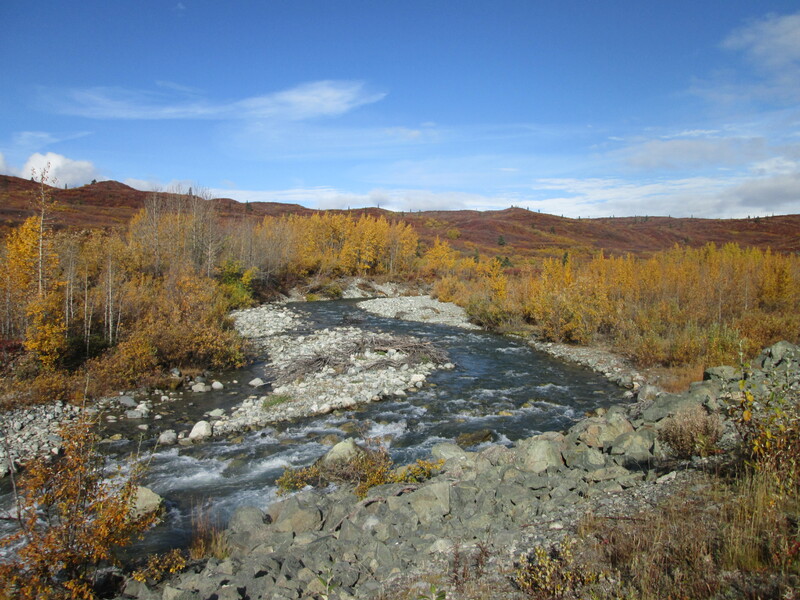 The salmon come to spawn in the creek before dying. There were dead fish everywhere and lots of others about too, frollicking around in the shallow. 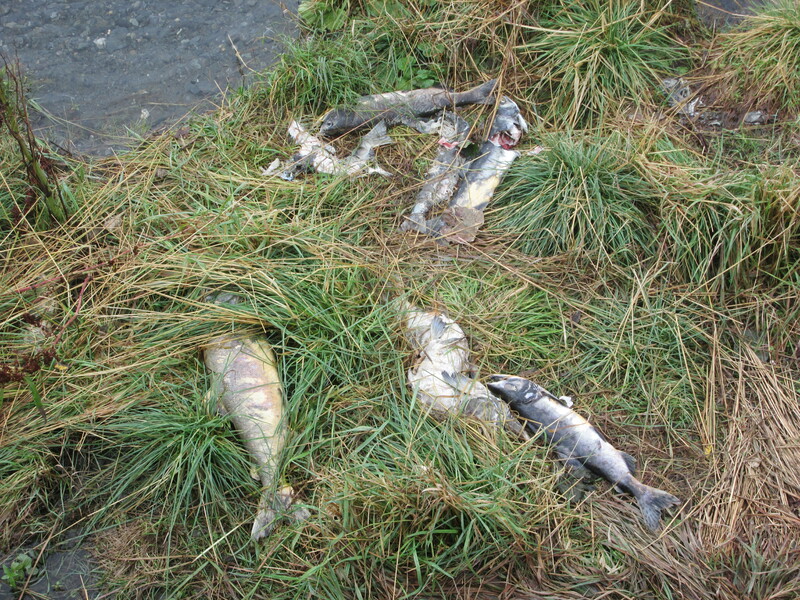 There was a pile of salmon on the bank. 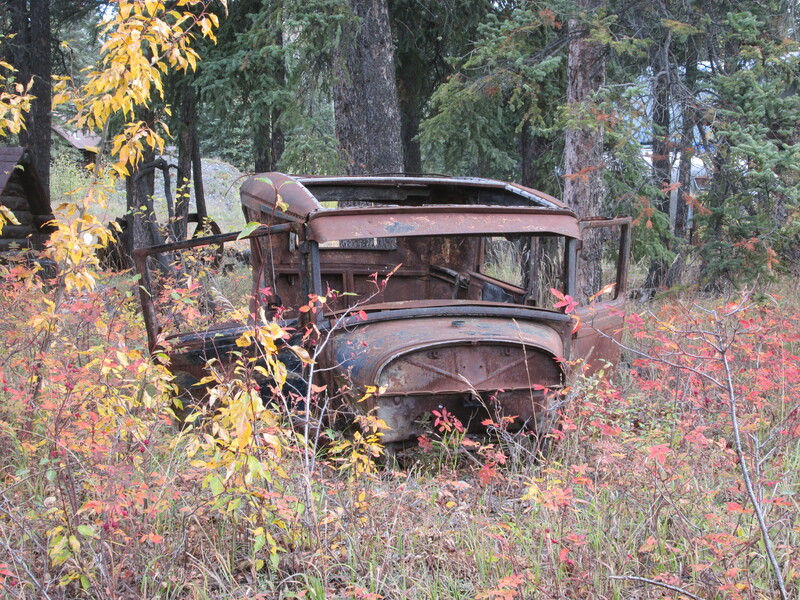 These had been pulled out by bears. Having no idea where I was going to sleep tonight I cycled into town. I saw a young woman pushing a bike and went up to ask her where the visitor’s centre and free Wifi were. I scared the daylight of her. She said I could come use the internet at her flat and that actually her flatmate had hosted a cyclist last month. 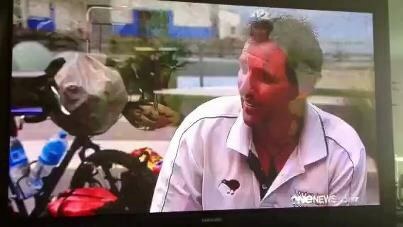 Jeremy was the owner of the house and soon after meeting him he asked where was I planning to stay. I replied that I was going to camp on top of the hill by the port. His offer to sleep in the lounge was quickly accepted. Was very happy to know I was going to be staying dry. I went for a tour down town to check out the waterfront and history museum…………..a lot about the earthquake. While Jeremy was working on his winter indoor gardening project in his basement which I thought was pretty cool. It went straight over my head as I realised that to grow your own Marijuana has just become legal in Alaska. I am on the quick ticket out of Alaska. 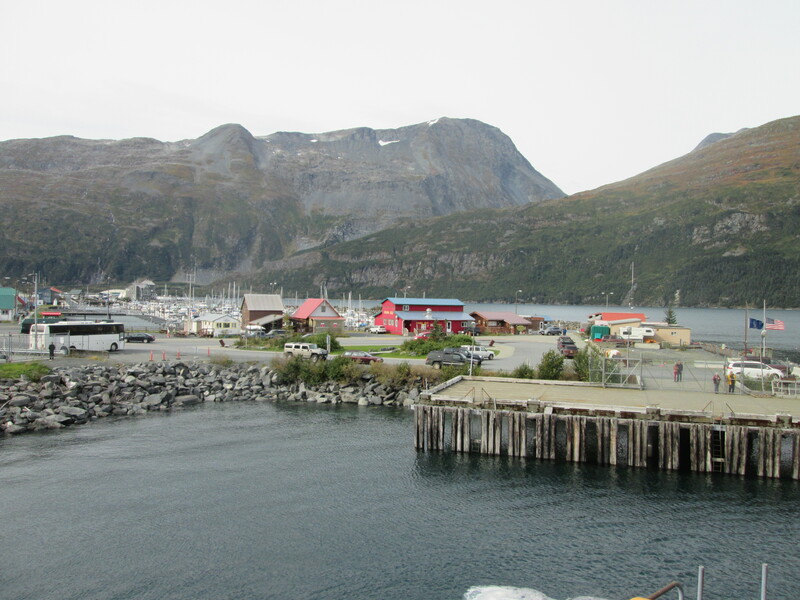 This morning I cycled down to the Port to catch a 3-hour car ferry to Whittier. It was a great day for it, with clear blue skies. It had snowed overnight so there was a lot of snow on the mountains. 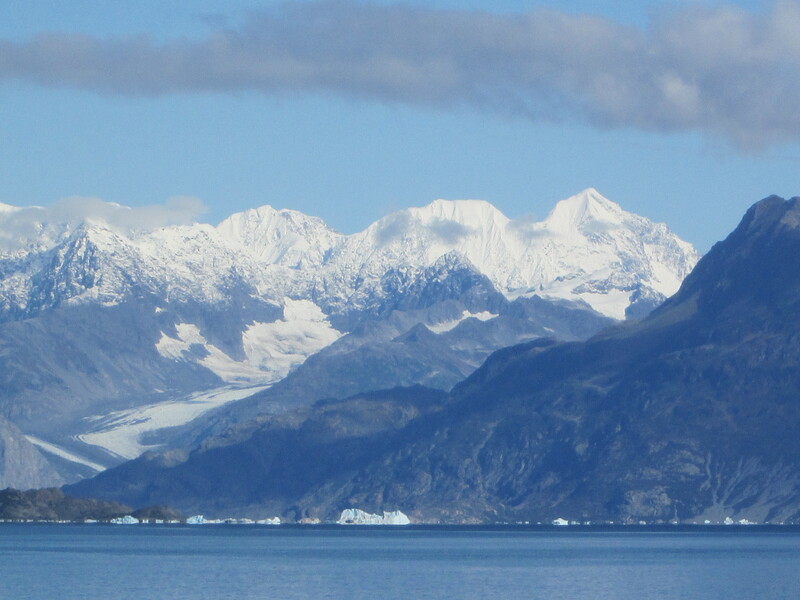 After a disappointing time coming over the pass yesterday, today was incredibly beautiful as we passed glacier after glacier, and saw sea otters and the odd whale and the odd iceberg. Whittier is an interesting town. It used to be an army port. Most of the town buildings were originally used by the army. Ninety percent of the town live in a Soviet style tower block. The other tower block that housed the army is now in ruins. When the army left in 1960………..there was 10 years of awlessness………..and everything went. I have a 36 hour stay over in Whittier. I don’t take the boat to Juneau till 11:45 p.m. tomorrow. Plenty of time so I had a bit of a walk around the waterfront before heading over the railway line to what you call the city……….really very little. I came across the old army gym which is now a sea kayak and boat storage business. It was open and I went in for a look. Soon after the owner Perry had offered me the use of the space to camp for the night undercover and unlimited tea and coffee and a couple of couches to chill out on. 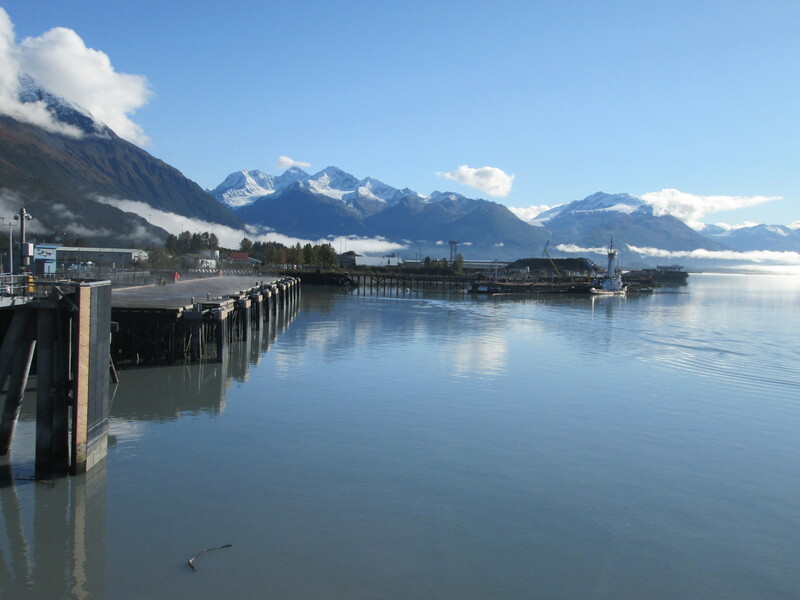 I had all day to kill in Whittier before heading back to the Ferry Terminal at 9 p.m. for the 11:45 p.m. sailing to Juneau. I parked my bike up at the front of the queue and went back into the terminal. When I came back to my surprise there was another touring bike parked up behind me. 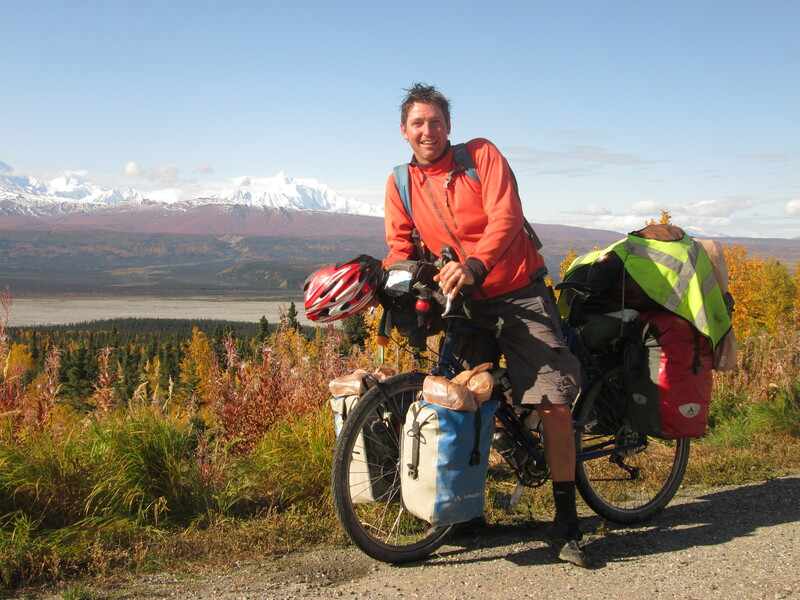 It belonged to Angela from Germany who is cycling from Inuvik in the Yukon to Eugene in Oregon. We got to put our bikes on the ferry before the cars started. 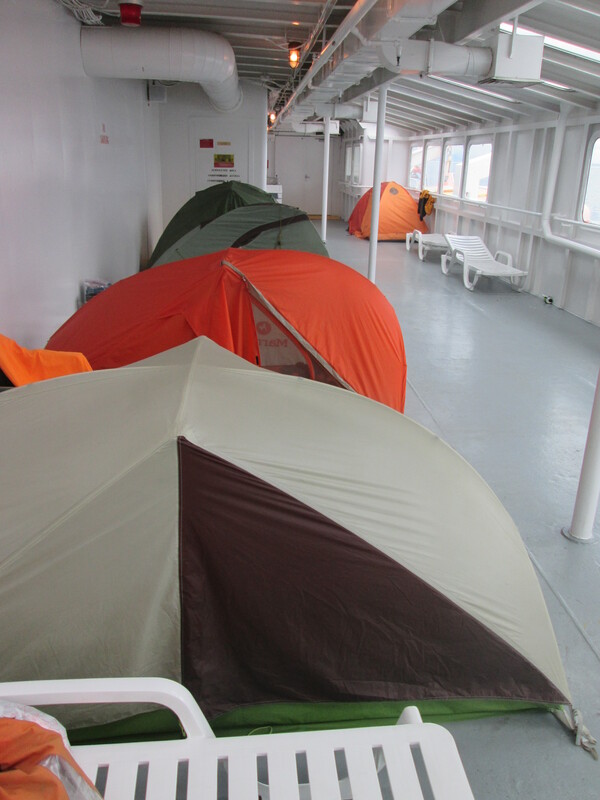 We then rushed up to the solarium which is on the 6th deck. It is where everyone camps. Got a good spot. It is a reasonable size ferry with a cafeteria. Great thing is you can get free hot water and use the microwave and eat your own food and drink in there. Only 150 passengers on a 500 passenger boat so plenty of space. Angela and I came across a 500-piece jigsaw puzzle someone had started in the lounge. They will be surprised when they return in the morning because we stayed up to 3 a.m. and finished it. A few hours after leaving Whittier we were in the open sea and it got a little rough with a 3 metre swell. I slept pretty well in my tent. The solarium floor was heated which was nice. 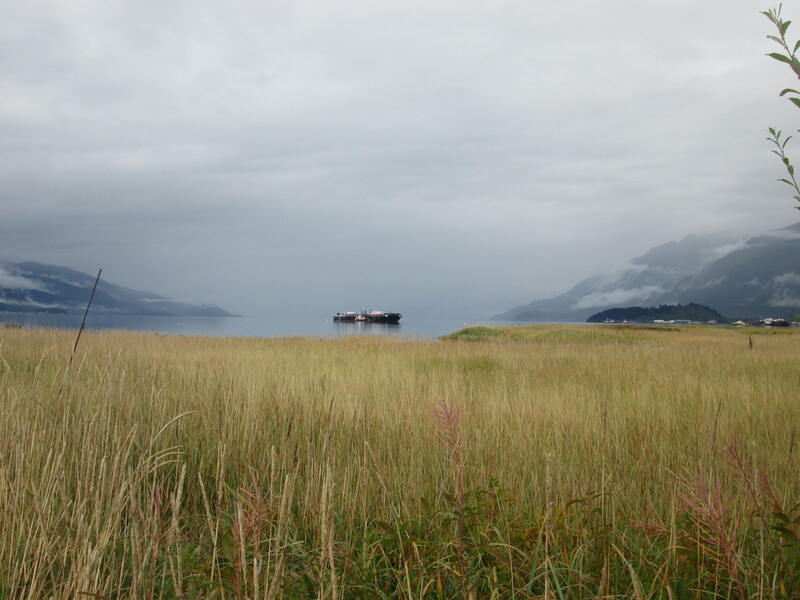 There is a movie theatre and just before lunch they showed a free movie on the inside passage. The day went so quick. It was a rush to have dinner before we could get off for an hour and 45 minutes in Yakatac, a small island with a community of 300. Angela and I stretched our legs and walked up into town and found the Bar for a quick drink and a chat with the locals before rushing back to the ferry. After Yakatac we went back out to the open sea and this time it was really rough, a 5 metre swell. I wasn’t feeling good. 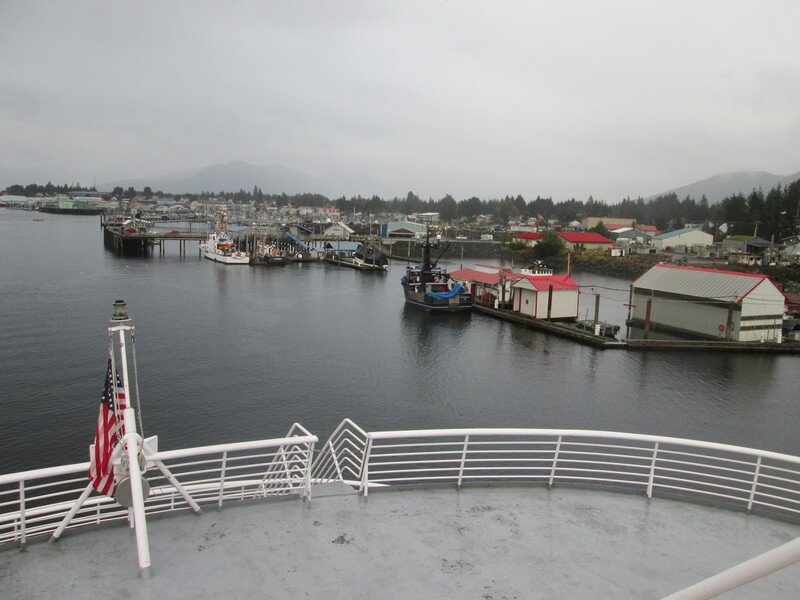 Things quietened down when we entered the inside passage. I was up at 7:30 a.m. standing close to the window trying to get a better reception for my radio when I saw an Orca swimming beside the boat. I was so excited I soon had everyone out of their tents to have a look. All morning we were crossing from side to side looking for whales. There were lots about including humpbacks. The most easiest way to spot them was to see their water spout. 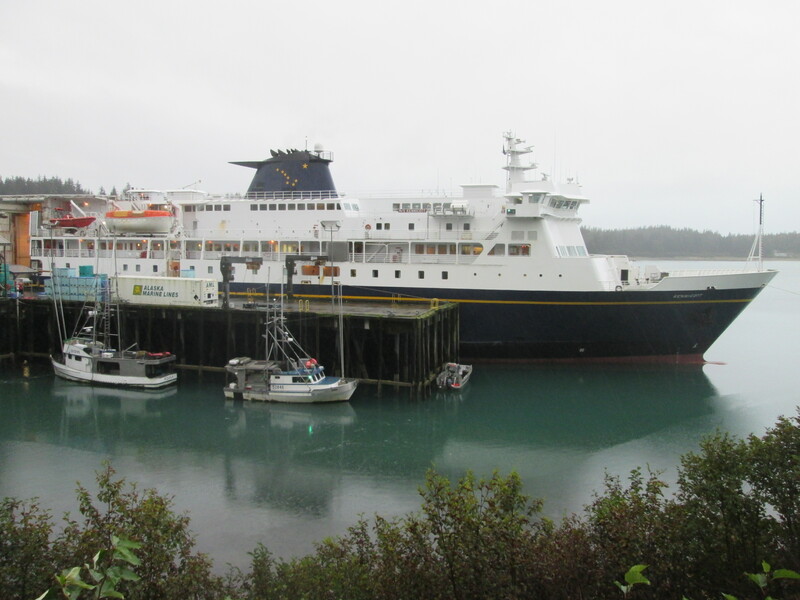 It was raining and cold when we arrived in Juneau. The cruise ships have pushed the ferry 20 km out of town. 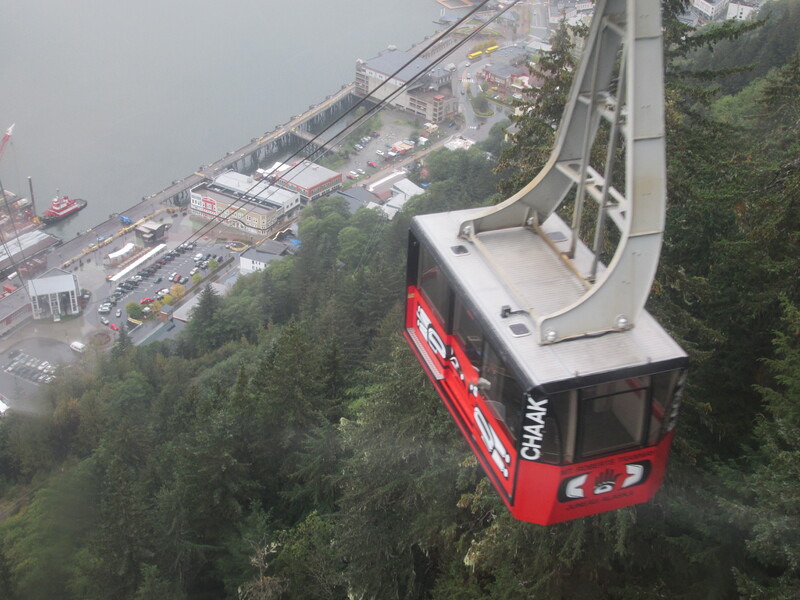 Juneau is the capital of Alaska and I will probably never come back here again. Since I got off the ferry, I now get to spend 5 days before taking the next ferry to Prince Rupert. I think there will be plenty to do here. I was very lucky to get a couple of “Warm Shower” hosts while I was in town. I first spent 3 nights with Stephanie and John in there lovely house over on Douglas Island. Their house looks back across Gastineau canal to Juneau. 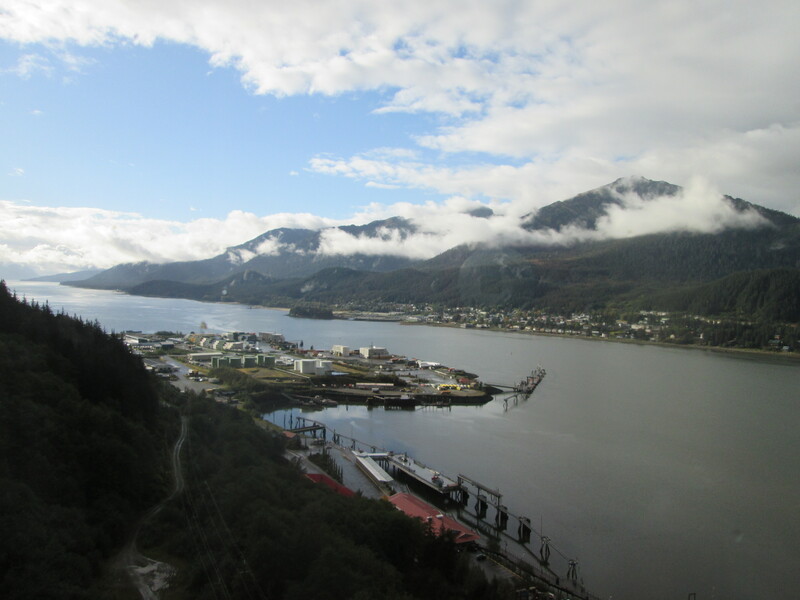 From here I was able to easily walk back into Juneau to do a self-guided walking tour. It started on the waterfront with a walk along the boardwalk passing some big cruise ships that were in town. From the boardwalk you can watch the fishing boats come in and unload their catch. Highlights of the tour were the Russian Church, time capsule and small native display in the federal building. By the afternoon I had worked up an appetite and it was timely when I came across a place that was selling Russian dumpling. 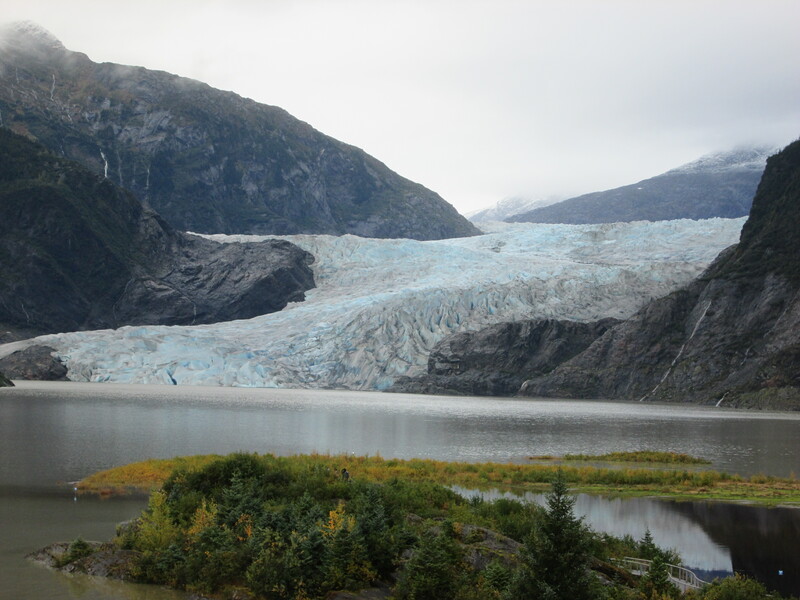 On Friday Stephanie and John kindly took me out to the Mendenhall Glacier – the one thing you must see when visiting Juneau. The Glacier runs into a lake and a few icebergs were floating around. We went for a very nice hike nearby. Fridayevening, John and Stephanie had a few people over for a dinner party. It was a lovely evening. 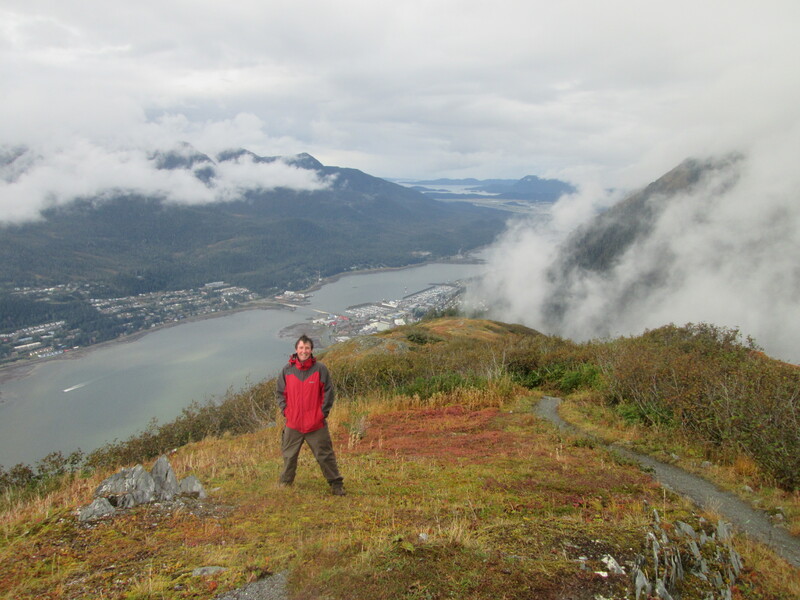 With Mt Juneau & Mt Robertson in the cloud for most of the time , we got a break in the weather and Stephanie took us up the Juneau Tramway. Stephanie’s guest pass saved me $35.00. From the top of the Tram, we went for a couple hours hiking up to Gastineau Peak where great views over Juneau were to be had. As we got higher we climbed back into the cloud. Near the top was evidence of snow. It was pretty cold up there. We timed it right because as we arrived back at the tram the rain returned. We stopped for coffee and a big plate of Nachos and to take in the view from the comfort of the restaurant. Later in the day I moved into town to stay with Julie, my second host. Julie lives in a 100 year old house very close to downtown. After dinner Julie took us out to a local bar for a couple of beers. It was good to get out. I very seldom go out in a city at night. 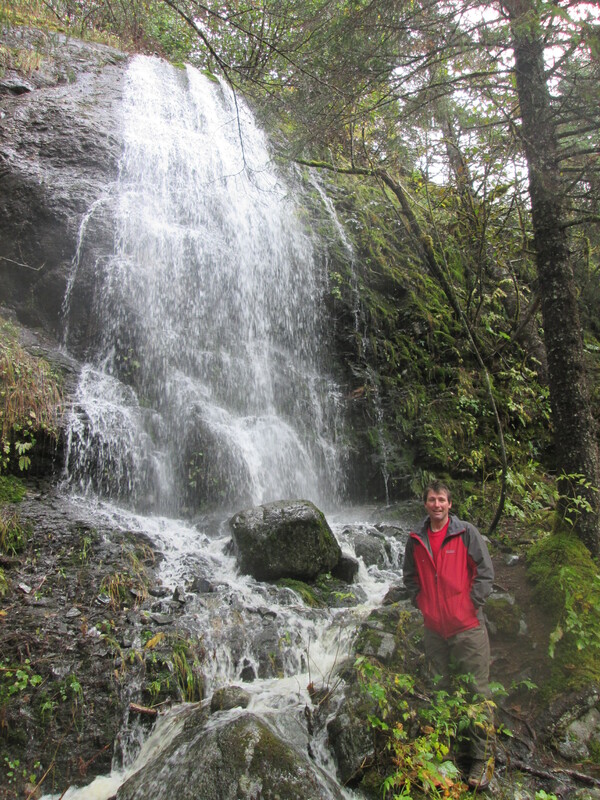 It rained every day I was in Juneau and today was no exception. 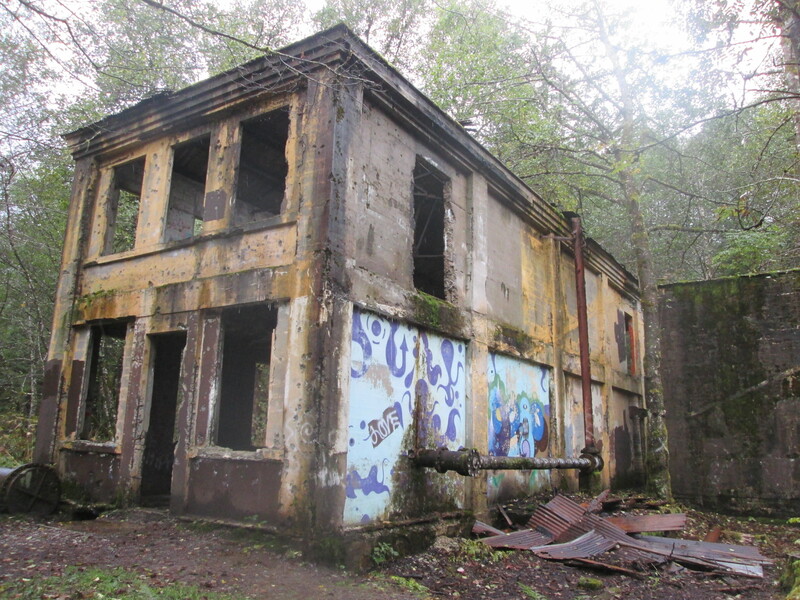 I waited for the rain to stop around lunch time and I then walked down to the Treadwell old mine ruins on Douglas Island. It was a real playground. There was stuff lying everywhere. Lots of the old buildings still remained…………at least their shells. 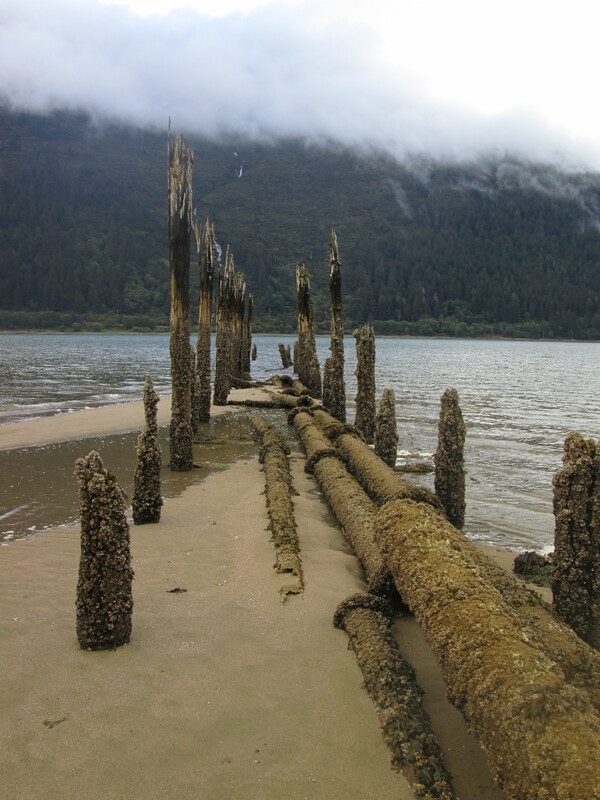 The sandy beach still had the remains of some of the wharf. 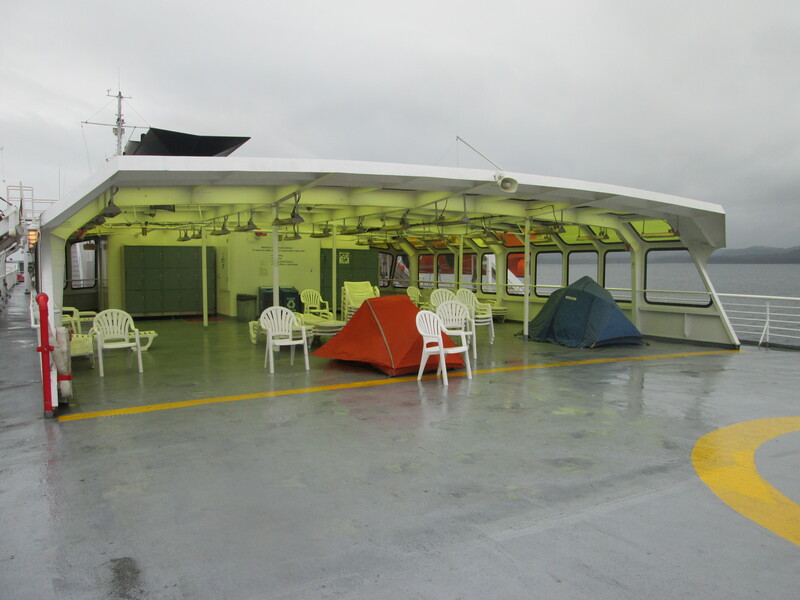 I was boarding the ferry for Prince Rupert shortly after 6 a.m.
After securing my bike on the car deck, I raced up to the Solarium to put up my tent. I was spoilt on the previous ferry. I got a shock when I got up there. The Solarium was on the top deck and at the back of the boat. You needed to go outside on deck to access it. The whole back of the solarium was open to the weather. It was dark when I put my tent up and I was the only one. Later, Zac a motorcyclist came and put up his tent. So we were two. As it got lighter I noticed it had snowed last night. All the tops of the mountains were covered in snow. Just reinforces the fact that it is a good time to be leaving. I went off and explored the boat and to find somewhere warm to hang out. The ferry is not too busy with 90 passengers, about 20 percent full. An announcement on the loudspeaker called for the owners of the tents to report to the Bursar. I was thinking o………great. Sounds like there is a problem. In the daylight I discovered there was a sign. No camping in the Solarium. They wanted us to move our tents more out onto the deck because there are heaters on the ceiling and it was a fire hazard. So we did. Afterabout two hours we had about 90 wonderful minutes of whale action, as we passed through a few pods. You didn’t know where to look next as there were water spouts and big splashes in all directions.The water was pretty flat so they were easy to spot. 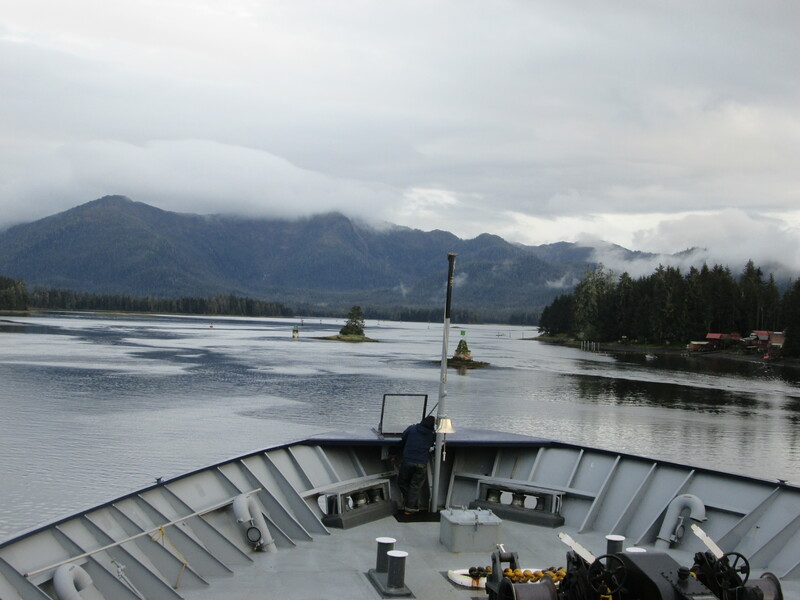 The inside passage is a nice sheltered trip with mountains on both sides. 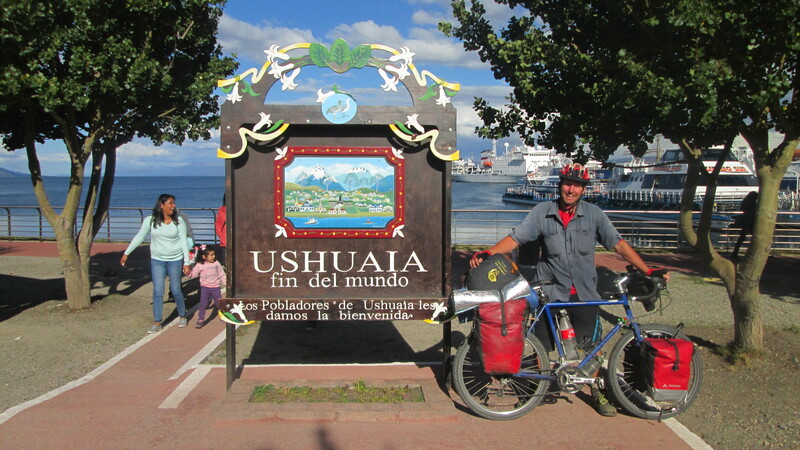 There were a few towns along the way for the ferry to stop. We were able to get off for a 30-minute walk in Petersburg. It was a very pretty town from the boat. One of the most interesting parts of the trip was passing through the narrows. A crew member needs to stand and watch from the front of the boat as we zigged and zagged through the channel. 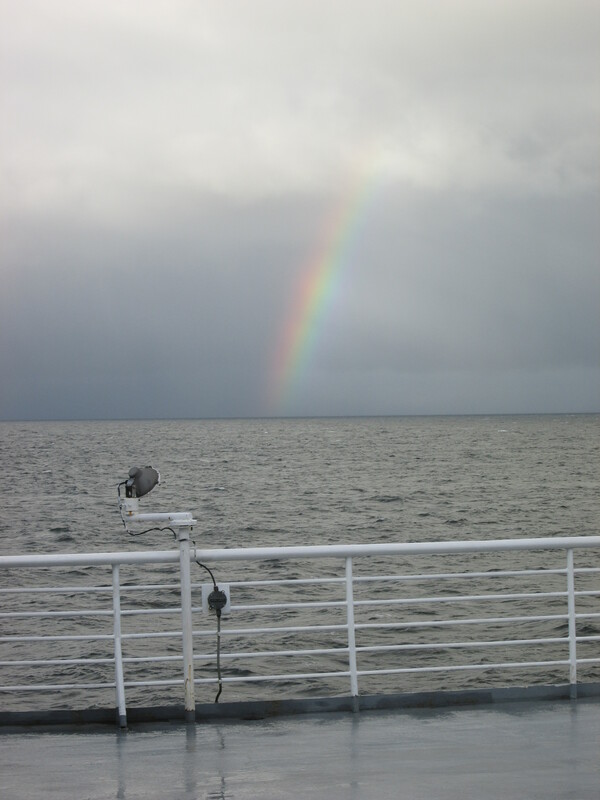 The weather deteriorated in the night and it was a wet and cold morning which made a few nice rainbows when the weather got the chance to clear. 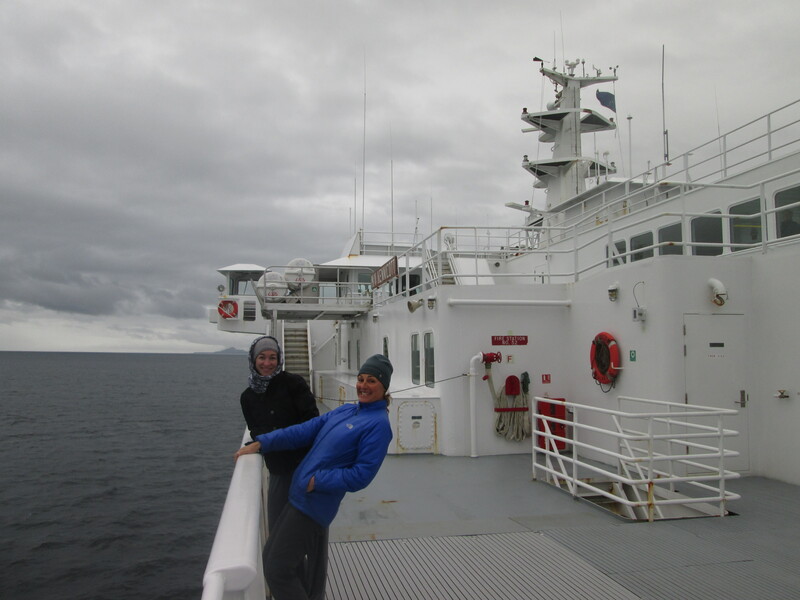 We disembarked back in to Canada around midday. A country change brought a time change with 1 hour more. I was slow to leave the boat and got stuck in the rain at the back of the queue for Canadian customs. The guy doing the marshalling told me to ride up to the front and on the side under cover. After a little wait, the customs guy kindly came out of his booth and called me over…………. I am lucky enough to have found a “Warm showers” host Chris and his wife Chelsea. They are living in a really nice house up on the hill that looks over the downtown of Prince Rupert and out onto the sea. We got one great sunset. 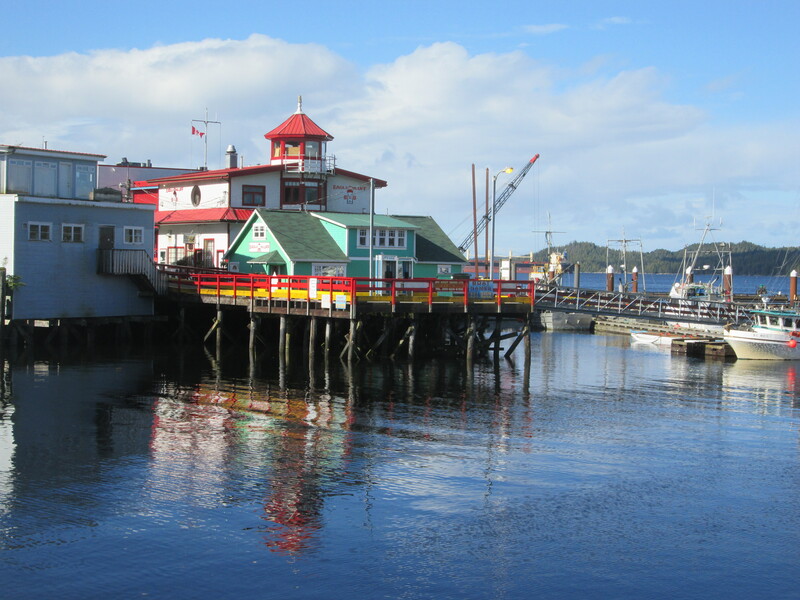 I am having a 3 day stayover in Prince Rupert before catching the ferry on Friday for Port Hardy on Vancouver Island. I am taking this time to get a well overdue hair cut which was $17 when I went in and only $10 when I came out, sort out the bike a bit and pick up food and also when it is not raining to have a look around the town. 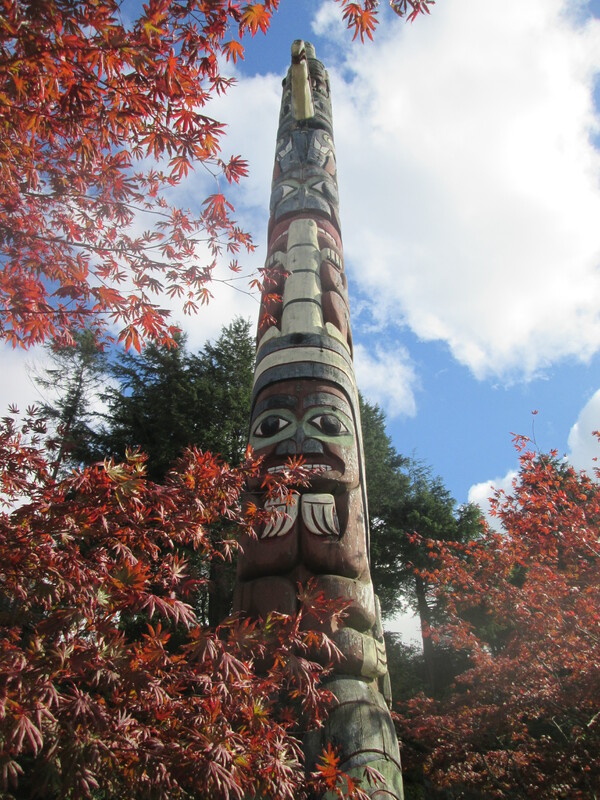 Scattered all around the town are totem poles.